Qualifying for the San Marino Grand Prix was a tale of two chapters. On Friday it was raining. Raining like it did when Noah was loading up the Ark. And while the Bridgestone runners splashed around looking like supermen, the Michelin boys were really in trouble. If the rains continued, we all said, Michael Schumacher would win the race by a lap and a half. There were two Ferraris and then a second gap back to a Giancarlo Fisichella's Jordan. Fourth fastest, a mere 1.8 seconds off the pace, was David Coulthard in the McLaren-Mercedes, the fastest of the Michelin men. There was an Arrows in the top six. The only ray of sunshine was that eventually Michael Schumacher drove over a nice wet curb and spun. He caught the spin and then drove the car backwards down the road for a while. "Ah," said a cynical fellow in the paddock. "In these conditions you could put a blindfold on him and he would still be on pole even if he was driving backwards around the track." The point, it seems, is that in the wet, Michael Schumacher has no rivals. Particularly when driving on Bridgestone wets. "If it stays like this we could have the advantage," said Schumacher, earning himself a nomination for a Nobel Prize for stating the obvious. Down at Michelin they were fighting fires. "You never know what fuel levels teams are running at different times on a Friday so it is hard to gauge exactly where we stand," said Michelin's Pierre Dupasquier, sounding rather less than convincing. "None of our drivers were complaining that driving in the wet was like driving on ice, which they suggested once or twice last season." No, perhaps not. But they were complaining. Was Dupasquier hoping for dry conditions on Saturday? That evening one of the engineers working for a Michelin team made a good point, as he downed another glass of red. "Perhaps it would do us good if it did rain tomorrow," he said. "That would at least get the message through to Michelin that the wet tires are still not good enough." The weathermen had said lots of different things and so on Saturday morning everyone (without a hangover) jumped up and opened the windows to see what the day would bring. The sun was shining and the Imola region was crisp and gorgeous. The crowds were out in force and if the temperatures were still pretty low, it was sunny and dry. The times of Friday became suddenly a huge irrelevance ‘ fodder for the shredder. All this meant that there was not much time for anyone to find a set-up for qualifying and so it was a question of engineering by the seat of the pants ‘ just like motor racing was when teams did not test as much as nowadays they do. And if the car was not perfect the drivers had to drive around the problems. Not surprisingly the result in the morning practice was something of a hotch-potch with a Ferrari (M Schumacher of course), a McLaren (D Coulthard) and then Barrichello, Heidfeld and the two Williams-BMWs with Ralf Schumacher ahead of Juan-Pablo Montoya. The break between sessions gave everyone the chance to think things through and come up with some solutions. And then qualifying began with a bang when Enrique Bernoldi's Arrows blew an engine before anything much could happen. The Dutch fans celebrated as they tend to do nowadays when Arrows hits trouble. The first serious runner to go for it was Ralf Schumacher and for a while he sat on pole but then Barrichello took away the prize only to lose it to Montoya. Ralf took it back again and Barrichello repeated his earlier move and so as we went into the last minutes it was the Brazilian on pole with Michael Schumacher second. Out they all came for the final moments but no-one seemed to be making much progress until the checkered flag popped out and then it became clear that Michael Schumacher was on a very quick one. The outcome was not a foregone conclusion but it felt like it. It was exciting but then we have had some pretty dull qualifying sessions so far this year so we are not used to too much excitement on a Saturday afternoon. This was good and the result was Michael on pole by 0.06 sec. A close fight. Both drivers said that they had had fun. Behind the red cars things ended up in a pretty dull fashion. Imola these days seems to be a race track where the value of the car outweighs what a driver can do: Williams was 3-4 on the grid (Ralf ahead of Juan Pablo) McLaren was 5-6 (with Kimi Raikkonen ahead of David Coulthard) and if Felipe Massa had not had an hydraulic problem Sauber would probably have been seventh and eighth. As a result Renault was 8-9 (with Trulli a split second ahead of Jenson Button) and BAR was 10-12 (split by the missing Massa) and then came an Arrows. There might have been two but Enrique Bernoldi's engine had popped its clogs and he struggled to 20th place in the T-car. Behind Frentzen came two troubled Jordans, two Toyotas and a mix-and-match set of Minardis and Jaguars or should one say Jaguars and Minardis. Alex Yoong was not able to get close to the pace and so failed to qualify and as the gap between him and the others was a noticeable one, the stewards decided that he should not be allowed to start. OVERTAKING at Imola has never been easy, but the recent years have produced some acceptable races. Ever since the death of Ayrton Senna the overtaking potential of the place has been ruined. This means that the opening seconds of the race are absolutely vital and with all the electronic devices now allowed this is not really down to chance and driver brilliance. It is down to the dust on the road and the brilliance of the men who write software programs. At the start in Imola the two Ferraris got away well. "The start was probably the same as Michael's but I was on the dirty side of the track," said Barrichello. This meant that Ralf Schumacher got the jump on Rubens. "I had no way to close the door any more because he was by my side. Basically I paid the price for the time I lost yesterday. If I had kept pole yesterday, probably the story could have been different." Once Ralf was ahead Rubens could do nothing. But then Ralf could not do much either. "I tried to go away from him," he explained. "But I realized whenever something went wrong and he had a little gap he was able to close that very quickly. I think he was simply sitting and waiting there. The Ferraris were clearly stronger than we were today so we had no chance and we did the best we could have done." At one point Eddie Irvine managed to get in Barrichello's way in his Jaguar. Barrichello was not impressed and when he finally managed to pass the Ulsterman, he gesticulated somewhat. The two men had a bit of a run-in in the Drivers' Briefing in Malaysia after the crash in Melbourne. "He's the one that talks so much in briefings," said Rubens. "Blah blah blah blah and then he holds me up for three quarters of a lap. He let Ralf by in a nice way, he could have let me by in the same place but then he came in and stayed in for another five or six corners. I just found it was silly, that's all. He's getting old anyway!" Irvine later made some unpleasant remarks about Rubens but the Brazilian had a valid point. The decisive move came when the two Schumacher Brothers, by then separated by 17 seconds, came in for their scheduled pit stops on the same lap. Barrichello put the hammer down and his next lap before he pitted was a second and a half faster than Ralf's IN lap had been. That was the decisive moment. Rubens came out ahead. The Ferrari fans cheered. If as Ralf accelerated down towards Tamburello the words "Game Over" had come up on his steering wheel display it would not have been a surprise... The Ferraris were 1-2 and that was how it stayed. 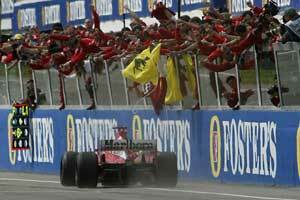 It was another dominant display by Michael Schumacher but it was without the fireworks that we had in Brazil. It was just cool Teutonic efficiency. "We were close in qualifying," Michael said. "We expected the race to become more difficult due to past experience but as we saw, Bridgestone has brought a new tire which gives us more consistency and we're very happy with that and that basically delivers the job. It was mainly due to the tires." The strategies were rather odd on the surface. Imola is usually a two-stop race but as the halfway mark beckoned here had been only a few pit callers. It looked as though some of the cars were going for a one-stop strategy. But that was not the case at all. The power of technology was seen a little more further back in the field. As the field went into the Tamburello chicane for the first time Montoya was in fourth place. Behind him, if the corner had been the door of Noah's Ark, the drivers would have been animals. They were two by two. McLaren was first; Kimi Raikkonen was ahead of David Coulthard. Then came Benetton (the paddock is having trouble remembering that the Benettons are now called Renaults) with Jarno Trulli ahead of Jenson Button. Then came Sauber, a slow-starting Nick Heidfeld ahead of a fast-starting Felipe Massa. Then came the two BARs with Jacques Villeneuve ahead of Olivier Panis. It was not long before they were followed by the two Arrows after Bernoldi (running a light fuel load) managed to overtake a number of cars carrying more gas. As the race went on most of the teams at the back began to drop away: Jordan, Jaguar, Arrows and Toyota would not finish a single car between them. Williams end the race picking up third and fourth. "We were beaten fairly and squarely," said someone in the team after the race. The tires were, of course, a big part of it but one gets the impression that the chassis still needs work. Just as the team feared when the car ran for the first time back in February. Michelin was at a loss to understand. "All the cars performed exactly as we expected them to ‘ it is just that the two Ferraris found a lot of extra speed from somewhere." There was little consolation except that there were four Michelin cars in the top six. "Evidence," said a cynic, "that Ferrari is the Bridgestone factory team and Michelin splits its efforts between two teams." That sounded harsh but there is an element of truth in it. McLaren was never a threat to those ahead and indeed for the first time the team seemed to be under threat from Renault (Phew, got it right that time!). Raikkonen was on his way to a rather dull fifth place when his exhaust broke. Things then began to get very hot in the back end of the car and it got to a point where the hot gases were heating up the rear suspension to such an extent that the McLaren engineers decided that they had to be prudent and called Kimi in to retire. Better to be safe than sorry. Coulthard adopted the long first stint "rain" strategy and went longer than anyone else. That mean that when he did finally stop he found himself behind Jenson Button, who had been running on shorter stints and had therefore been going faster. Button stopped again and was back behind David but when Coulthard came in for his final stop Button took the place back again and won the battle for fifth place. Four laps after that happened Coulthard looked in his mirrors and found himself staring down the barrels of the Schumacher shotgun. On lap 54 David pulled over to get out of the way the Ferrari. He did so in front of the McLaren pit, perhaps to make sure that Mercedes-Benz boss Jurgen Hubbert had a chance to see what was happening. It looked like a cry for help... or at least a cry for more horsepower. "Our lack of speed is a direct reflection of those elements of the package which are not where they need to be," said Ron Dennis. "The reality is that we have known since Malaysia that it is going to take time to close the gap to the front of the grid." Norbert Haug, who had had a less than graceful weekend, stomped off back to Stuttgart, looking grumpy. Button again made Renault look good while Trulli ended up ninth, which did not look like a great result when one considers that the Italian was seventh at the end of the first lap. His battle, he said, had been with high gearbox temperatures. BAR ended up with Villeneuve seventh and that was a good result given the performances of late. "We are still unable to run enough downforce on the car and we are under no illusion that there is plenty of work ahead of us," said technical director Geoff Willis. With more horsepower the car could drag more wings along with it and so there would be downforce available. Perhaps a little aerodynamic tweaking would be helpful as well but the horsepower issue seems to be the main issue. Panis was with Villeneuve all the way until his throttle linkage broke on lap 44. If it had not been for Sauber the race would have been even duller than it was. The first 16 laps offered little excitement. Porridge is more exciting. Then a Sauber went whizzing into the pits. What strategic brilliance is this, we thought. A three stop strategy? A short first stint to make up for a bad qualifying? In fact it was nothing of the kind. It was the result of human error. "I thought that the team had called me in on the radio," Nick Heidfeld said. "It turned out they hadn't. When I arrived in the pit nothing was ready." What had happened was that the radio call had been to Massa. He had started with a light fuel load to make up for his poor qualifying. By the time the mess was unraveled Heidfeld had lost seven places. Four laps later, having overtaken two cars, Heidfeld stopped again. This time he rejoined so quickly that the stewards gave him a drive-through penalty. By lap 24 Heidfeld had been in and out of the pits three times and was running down in 17th place. The Massa strategy failed as well because the early stop dropped him to 13th. He came back up to eighth (where he had been already) and then had to stop again and it was back down the order again. In the end however he did pull off a bona fide overtaking maneuver, passing Trulli for eighth on lap 58. Such things were few and far between on a rather dull day in Imola. Heidfeld finished 10th after four visits to pitlane. And the only other car still running was Mark Webber's Minardi. Of the rest, there was nothing but pain to report ‘ so perhaps we will let them off this week.